Products purchased regularly and out of necessity are considered "staple goods" to your store. Traditionally, these items have fewer markdowns and sometimes lower profit margins. While price shifts may raise or lower demand for certain kinds of products, the demand for staple goods rarely changes when prices change. They are necessary items for you to remain in business. Staple goods (also known as staple products, staples, core products, and necessity goods) are inventoried items that are core to your business. For example, hooks and fishing line are staples of a tackle shop. Golf balls are a staple product for a golf pro shop. If you have a grocery store, bread, milk, and eggs are likely among your staples. Most customers are only uniquely aware of staples when you've sold out. Consider what can happen to grocery store shelves during emergency weather conditions. On the rare occasion each year when warm climate states get ice and snow, the grocery store shelves are emptied of the "staple goods" by worried consumers who fear they will be stuck at home for an extended period of time. Shoppers seldom purchase staple goods based on price. It is powerful knowledge for a retailer. Consider our golf pro shop example again. When you are about to tee off for a round of golf, you need balls, and you are willing to pay more for them onsite since you need them immediately. On your way to a family picnic and need ice and drinks? You stop at the shop on the way just for the convenience. And while you may complain about the price, you still buy. The fastest way to lose customers is to run out of the staples in your store. When surveyed about retail store perceptions, customers reference being out of stock on the "basics" (staples) as one of their main reasons for shopping elsewhere. 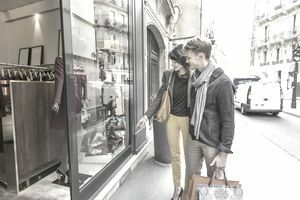 While retailers tend to focus on having the latest styles and trends, it's the basics that will drive your customers to shop elsewhere. Imagine going to a grocery store for bread, and it was all out. What would you think about that store? What would it do for your confidence or trust in that retailer? Would you return or shop elsewhere next time? If it was a staple good you needed, the chances are very high that you will vote with your feet and shop elsewhere from now on. When Staple Products Become "Accessories"
In the industry, there is often a lack of attention paid to the staple products. These products often get relegated to "accessories" status in the store. While it is true that many staple products are compliments or accessories to other items—you need a fishing pole before you need a line, for example—the truth is that many customers shop your store just for the staples and not the rest and they expect you to always have them on hand. So you better pay close attention to keeping them in stock. The net result of relegating your staples status to accessory status is that you treat it as a second-class citizen in your inventory management. In other words, you need to reserve some open to buy for these items each week. Too often, a retail store will buy too much "trend" inventory using up all the available cash flow from open to buy. This means when they run out of the staple goods, they lack the funds to replenish them. And this will dramatically affect the customer experience. Be smart with your inventory of staple products. Some would double the backstock just to be "safe." Again, this is poor inventory management. Inventory in the backroom costs you money. And the lack of money often forces you to implement markdowns in your store before season end just to generate some cash. However, a customer knowing they can count on you for staple goods is a fast way to build loyalty to your store. So, put your staple goods on auto-replenishment.